A very powerful but complicated Shopping List app that is fully configurable and supports multiple shops,. The Shop List stores a list of shops, each shop is divided in a set of sections like “vegetables'” or “drink”. Each section contains individual products. 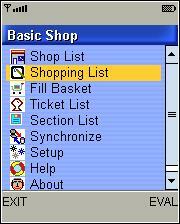 Once in the shop, click “Basket List” and check off items while put them in your real shopping cart or basket. The app computes the total amount , warns you if something is missing and updates statistics for future suggestions. The app “ShoppingList” (61 KB) is ready to download or send to your phone as filename:”ShoppingLis”. Keeps posting Error! after I try to send to my I465. The Sprint server that sends apps to iDEN phones is down. These outages usually don’t las long so try again later.